As part of EFF’s 25th Anniversary celebration, we’re releasing a Creative Commons-licensed anthology of short fiction! 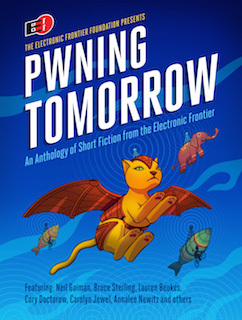 The ebook is called “Pwning Tomorrow: Stories from the Electronic Frontier,” and it features speculative fiction from more than 20 authors, including Bruce Sterling, Lauren Beukes, Cory Doctorow, and Charlie Jane Anders. The authors in this collection explore the wonders and perils of technology over the next 25 years and beyond, imagining the consequences of everything from abusive intellectual property lawsuits to out-of-control viral marketing; from over-protective intelligent fridges to violently loyal cyber-pets. Imagination plays a significant role in our work to protect digital civil liberties, and we have met many fellow speculative fiction fans in our 25 years. I hope you are inspired by these stories and share them with anyone who may enjoy taking a brief trek into the future!